Nicky Henderson paid tribute to Sam Waley-Cohen and the work that has gone into turning the talented young French import Long Run into the first six-year-old to win the totesport Cheltenham Gold Cup since Mill House in 1963. The trainer, enjoying his first victory in the race, said: “It is the race and it’s the one everybody wants to win. The Grand National is the other that’s missing but the Gold Cup means you’ve got the best horse. “We saw a great race. All the big boys were there and they ran up to their best. We were the underdog, if you like, and Sam gave him a beautiful ride. We must not underestimate how significant that is. Remember, this isn’t his day job and it’s some achievement to come out and take those boys on. “Over the years we have had a lot of French horses. The one thing we’ve learnt is that they’re taught to jump through a fence rather than over one. It’s a trait that one has to iron out as best as possible and his technique sometimes wasn’t naturally designed for English fences. “Sam comes down a lot and the horse hasn’t seen a steeplechase fence (at home) all season. It’s all poles to develop his technique and that’s what we’ve been working on. Last season, Long Run disappointed in third when second-favourite for the Grade One RSA Chase, but Henderson noted a significant difference in the gelding as this year’s big day dawned. Long Run’s jumping has been questioned in the past, notably at last year’s Festival and in the Paddy Power Gold Cup at the course in November. Sam Waley-Cohen, who became the first amateur rider to clinch Gold Cup victory since Jim Wilson triumphed on Little Owl in 1981, gave his insight into the race. He said: “At certain points in that race it was certainly not how I had imagined it. He jumped the first two incredibly and then the one I least wanted to get wrong, the one down the hill, he thumped. I thought this is not great, I’ve got to get him to jump. “The thing about working with Yogi (Bresiner) has really been about working to his strengths and we know where he does really well is pick up. I had started asking him. You just have to find the race as you find it and I suppose in my mind’s eye I did sit behind the front two coming down the hill. “Nicky said to me before the race, don’t get there too early. I said to Dad when we walked the course, at Kempton he found more with some clear air in front of him in the King George. “I would have liked to have got there just swinging off them but he was just beginning to travel into it and at that fence at the top of the hill, he had to pick up and be brave at it. It’s rough out there and at the end of the day, Gold Cup’s are a war. It might be a brotherly war but nonetheless it’s a war with no quarter given. 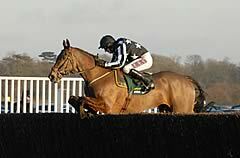 To sit behind Kauto Star and Denman thinking, come on you’ve got to jump, you’ve got to jump, it’s a very special feeling. “I went out there to ask this horse a question, do you have the courage for this? Sometimes you see a horse on the gallops and you think it’s going to be the greatest horse you’ve ever seen then it comes out and it folds at the first under pressure. What marks out a horse like Long Run is the fact that he fights, he wants it and he has courage. That’s the mark of a truly good horse. Long Run began his career with trainer Guillaume Macaire, initially racing in the colours of breeder Marie-Christine Gabeur. He finished runner-up in a Listed hurdle at Auteuil on his career debut in May, 2008, and scored later that month when defeating the smart Mr Thriller in a two and a quarter-mile Listed hurdle at the same venue. He raced 12 times in France, each time at Auteuil. On September 4, 2008, he first sported the colours of owner Robert Waley-Cohen and won the following month’s Grade Two Prix Georges de Talhouet-Roy (a two-mile hurdle) by six lengths. His first Grade One triumph came on November 9 over the same course and distance in the Prix Cambaceres and he won a Grade Three in March, 2009. He went on to be runner-up finish in the Grade One Prix Ferdinand Dufaure in May, 2009, and returned to action in the autumn with a four-race winning streak in races that included France’s equivalent of the Triumph Hurdle, the Grade One Prix Maurice Gillois Grand Steeple Chase 4 Ans, in November. He moved to NickyHenderson’s Lambourn yard shortlyafterwards and made a stunning British debut with a 13-length defeat of Tazbar in the Grade One Feltham Novices’ Chase over three miles at Kempton in December, 2009. He dropped back to two miles for the Grade Two Kingmaker Novices’ Chase at Warwick in February, and easily landed the spoils by 12 lengths, despite some less than fluent jumping. Similar errors also cost him at last year’s Festival as he made several mistakes before coming home third behind Weapon’s Amnesty and stable companion Burton Port in the Grade One RSA Chase. Long Run started this season with a first foray into handicap company in the Paddy Power Gold Cup at Cheltenham on November 13 when, despite being sent off a red-hot 2/1 favourite, he could only take third behind Little Josh. The introduction of earplugs alongside several sessions with a Harley Street chiropractor meant that Long Run lined up for Kempton’s rearranged King George VI Chase on January 15 a revitalised horse. Always tracking the leaders, he moved up to take the lead three fences out and he soon powered clear of his rivals for a stunning 12-length success over Riverside Theatre, with defending champion Kauto Star a further seven lengths back in third. He will bid to strike another blow for the new generation of chasers when he lines up against Imperial Commander, Kauto Star and Denman in the totesport Cheltenham Gold Cup at Cheltenham on March 18. Should he be successful in chasing’s Blue Riband, Long Run became the first six-year-old to triumph since Mill House in 1963, while his jockey Sam Waley-Cohen would be the first amateur for 30 years to win the race. He was third to the past totesport Cheltenham Gold Cup winners Denman and Kauto Star two out but came through to challenge jumping the last and go away on the run to the line to gain a famous victory by seven lengths. Nigel Twiston-Davies reports that last year’s totesport Cheltenham Gold Cup winner Imperial Commander burst a blood vessel before being pulled up in this afternoon’s renewal. Paddy Brennan’s mount made a mistake and was taken out the race in the closing stages as Long Run powered to success. 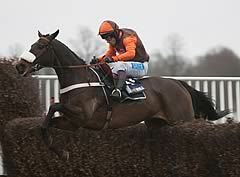 Twiston-Davies said: “He burst a blood vessel but is fine apart from that. “It must have happened at the top of the hill as he made a mistake at the next fence. The Naunton handler also reported his 16-year-old son Willie to be none the worse following his fall from Baby Run in the Christie’s Foxhunters Chase Challenge Cup. The horse won the race under Willie’s brother Sam 12 months ago and held a commanding advantage when his jockey unseated at the second-last. The trainer added: “Willie is a bit miserable but he’ll be OK.
“Baby was still there but just did not take the fence. They were probably going a bit fast for him and he put down.